Today I am playing over at the Color Throwdown Challenge #385 which is Teal, Aqua and Gold. This is truly one of my favorite color combinations. Actually, I like Gold with a lot of colors -- pink, purple, red, black - you name it, I like it. I am much more of a gold girl than a silver one. For this Challenge I kept things pretty simple and didn't even do any stamping. I chose Papertrey Ink Tropical Teal and Hawaiian Shores Cardstock and Simon Says Stamp Surf Blue with some gold foil cardstock. I treated each of the three colored cardstocks with Iridescent Gold Glimmer Mist and allowed it to dry before cutting it with my favorite, Simon Says Stamp Stitched Rectangle Dies in the two largest sizes. You could probably use the Tsukineko Gold Shimmer Spritz to get the same effect. I taught myself a new trick with these dies tonight. I really wanted a triple mat on this card to incorporate all three colors of card stock but there isn't an in between size in the dies. So I cut two of the colors with the largest stitched rectangle and one from the 2nd largest. Then by repositioning the positive piece into the die and realigning it to take a bit off of two sides, it cut just enough off to make the middle size mat. I'm sorry for so many pictures, but I know just the words may not be enough for you to understand what I did. By taking just that little bit off of two sides, it made a mat for the in between size that still has the stitching lines in place. You could do this with any dies that have straight edges like squares or diamonds. I've used a similar method to this in order to get a narrower rectangle for my cards. My Simon Says Stamp Stitched Rectangles are already my most used dies so I'm happy that I can stretch them even further now. I love this new die from Impression Obsession that says "Wishes" and I think it paired perfectly with the Make a Wish Die from Spellbinders. You could add your choice of other words to it like Birthday, Happy, Best, Easter etc. and cover a whole bunch of different occasions. My style tends to run more towards elegant than cute so I really like the way this card looks. It was really simple to make but very elegant with the gold dandelion and word die. Everything is mounted to an A2 Card Base made from Papertrey Ink Stamper's Select White #110 Cardstock which is my hands down favorite. It's super smooth and heavy enough to make a nice crisp card. Thanks so much for stopping by to check out my project. I have several others in the works this weekend. If you have any questions or comments, I do read every single one. Have a great Easter Weekend everyone! Beautiful CAS design and I am with you on loving to use gold! 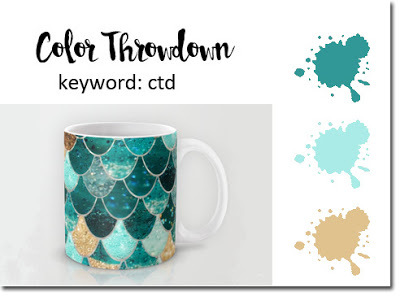 So happy you joined us at Color Throwdown this week! Love the layering...choice of colors!! The shimmer mist behind your gold image and sentiment are perfect!, so glad you joined us at CTD! Airy and beautiful!! Love the dandelion!! Colors are fabulous!